Its Baaaack!! 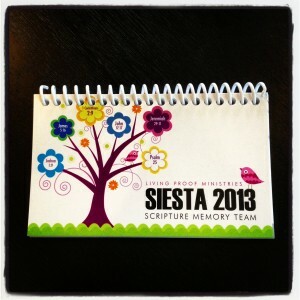 Siesta Scripture Memory 2013! I can't tell you how excited I am to embark on another exciting year of Beth Moore's Scripture Memory Team. This will be my third time joining in with this group, and I cannot express the incredible journey this will be for everyone involved. I always feel covered in prayer and God's love as I go through this journey, and I pray I can meet some wonderful ladies and travel to Houston, Texas next year to celebrate this journey. "Don’t just pretend to love others. Really love them. Hate what is wrong. Hold tightly to what is good. Love each other with genuine affection, and take delight in honoring each other. Never be lazy, but work hard and serve the Lord enthusiastically. Rejoice in our confident hope. Be patient in trouble, and keep on praying. When God’s people are in need, be ready to help them. Always be eager to practice hospitality." Here is to 15 days of studying this sweet scripture! !